And then there’s the girls. Not much to compare. 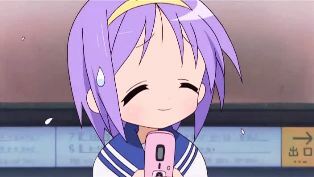 Where Azumanga was great because of Yomi and Sakaki, Lucky Star has only one girl that carries the show. 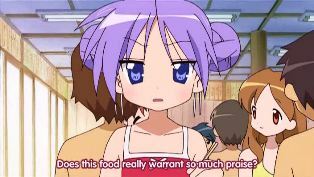 Kagami is great (and its these kind of statements that get me into trouble. Bah). 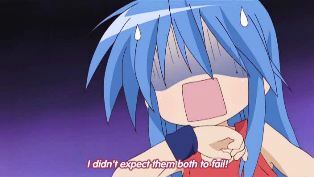 Konata fails because in the episode, her deviousness in getting Kagami and Tsukasa to ride with Yui backfires when Nanoka gets lost. Repeatedly. Nanoka driving a mini-van, getting lost, and wearing that hot two-piece on the beach just raises her so far above Yukari that….um, yeah, I’d better stop otherwise there’ll be no football next season. The humor seems to have jumped up the last two episodes, so much so that I’m kinda wanting to have less and less of Lucky Channel. Though episode 7 with Minoru in pigtails, was probably the best one yet. 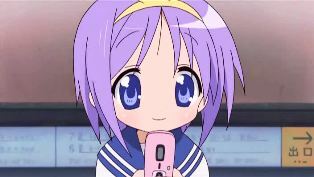 In addition to Minoru saving the Lucky Channel segment, the whole Tsukasa and her cell phone part was pretty much the highlight of this episode. 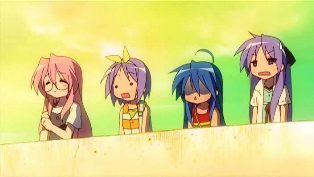 The different faces that she went through with the cell phone (and the different looks that Kagami usually goes through in dealing with Konata) had me laughing. So I hope that the humor keeps going in this series. 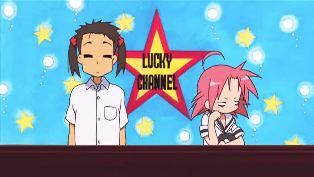 Despite that, I think Lucky Channel would probably do well as a spin-off - in an Extras sort of way. While I liked it, it never really was the highlight of the show for me. It detracted a whole minute or two away from the greatness of Kagami. 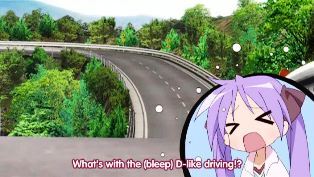 With the humor of Lucky Star increasing, I don’t see the need for it. Well, I never really did get it, but I loved Akira’s extreme two-faced flips from uber-kawaii idol to an embodiment of jaded and bitterness. Not to mention, I’d love to see Minoru Shiraishii sweat it out for a half an hour each week as he tries to survive working with Akira. Think of it as a sequel to running Man - Running Man: Lucky Channel. I think that deserves its own show. I’ve also come to actually like the artwork of the show. I’m glad that KyoAni didn’t do there (by now) normal “Oooooooooh, look at the purrty pictures” artwork like their last few shows. 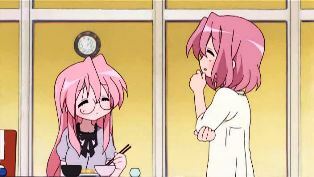 But that’s not to say that I wouldn’t mind them making Lucky Star look as good as Kanon, etc. Winning is so worth it; it doesn’t even matter what it is. That last cell phone snap is hilarious! Blog image header material there. 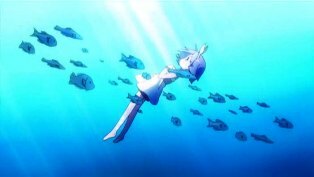 Although, your current header has Yuki in it, and anything with Yuki in it is win. Sadly, my wins are far and few between, but it is nice to enjoy. That whole scene with the cell phone was pretty funny. 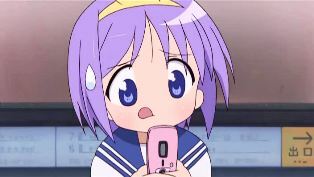 I wasn’t a big Tsukasa fan, but just watching her attempts to navigate that phone endeared her a little more (not quite to Kagami’s level). Yep, she’s not quite at Yuki’s level, but there’s still a lot more episodes to come.